There’s never a bad time for soup and I have plenty of fun creating new and easy recipes for soups, especially ramen. This recipe is no different. It’s an easy to copy and quick to prepare recipe too. I also introduce the lowest carb noodles out there. 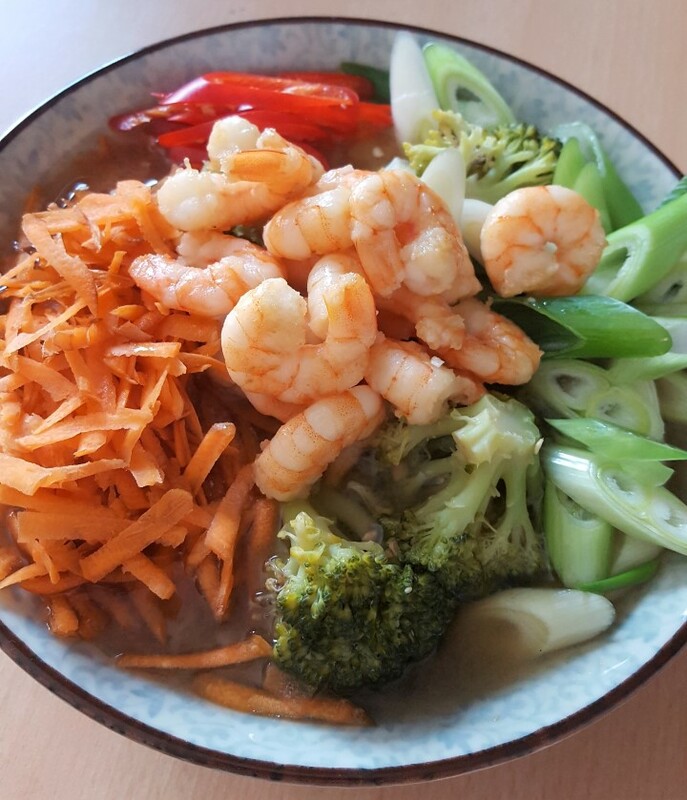 Have a look at my shrimp shirataki ramen. 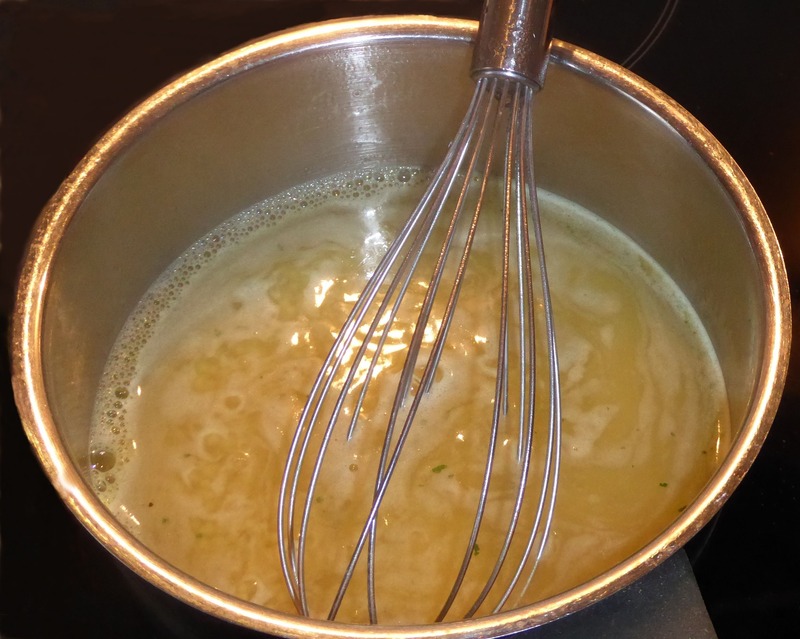 The base of every good soup is the broth. 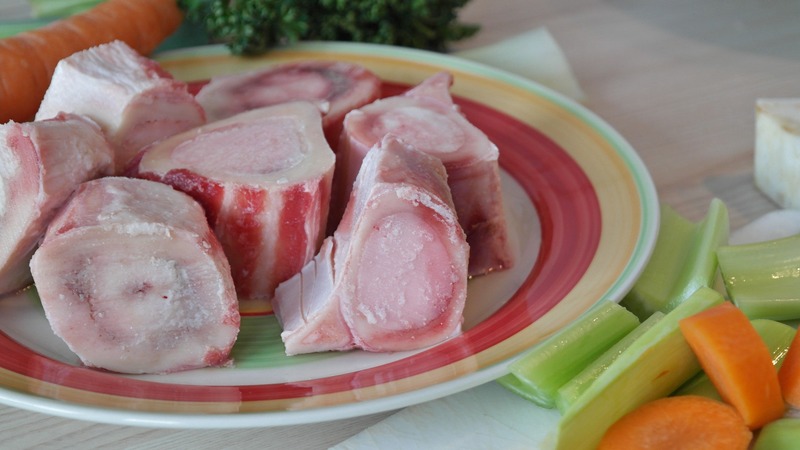 Ideally, you would make it from scratch with bones or vegetables. That’s what I do every now and then and make the soup on those occasions a hearty treat and an elevated dish. Yet, those type of broth isn’t very practical if you want to whip up a quick and healthy dish. That’s why you can either prepare plenty of broth in advance and freeze it in convenient packages and use them when you make a soup. You can also use stock or paste. For the shrimp shirataki ramen, I used a combination of soy bean pastes, doenjang and white miso. To round up the flavours I added seasoning. I can nothing but recommend to mix up several ingredients for a broth. It gives a deeper and richer flavour profile to your soups. Who would have thought a few years back that I could get so deep into seafood and fish? I certainly wouldn’t. This recipe features a shrimp and is the star of the dish. As it’s hard to get fresh uncooked shrimp (at best I have the chance to get defrosted raw shrimp), I used cooked shrimp. I aim to buy them from sustainable sources. Yes, it’s more expensive but it’s, in my opinion, the way it ought to be. Unsustainable behaviour will cost us – the human race – a lot and I want to add my share in a sustainable lifestyle (it’s certainly not easy). 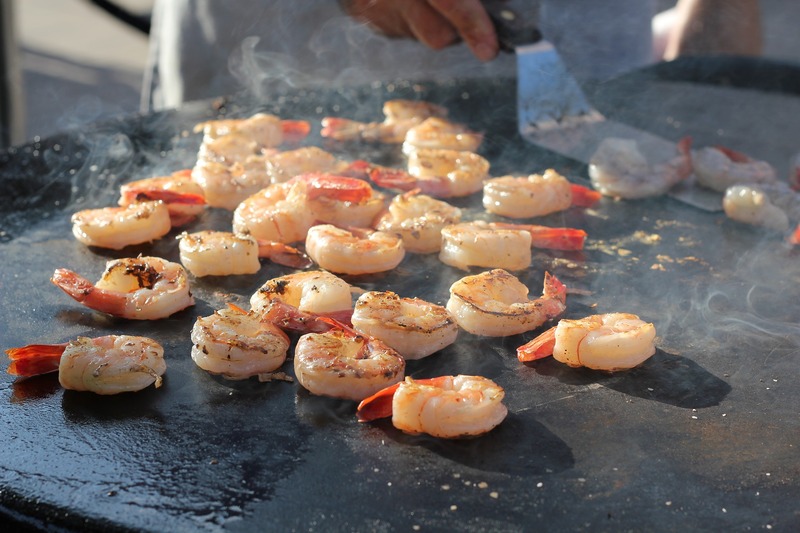 Shrimp have a distinct texture with a sweet and light salty flavour attached to them. I wanted to let this flavour shine through and made sure that I prepared the shrimp separately from the rest. In order to really let them shine I stir-fried them for a few moments in sesame oil. The two flavours go well together and if you use little enough the flavours merge and combine to something better than on a stand-alone basis. The special ingredient in this dish and the reason the shimp shirataki ramen are indeed low carb are the shirataki. Shirataki are very thin and translucent when it comes to the visuals. They are traditional noodles in Japanese cuisine and are based on konjac yam. 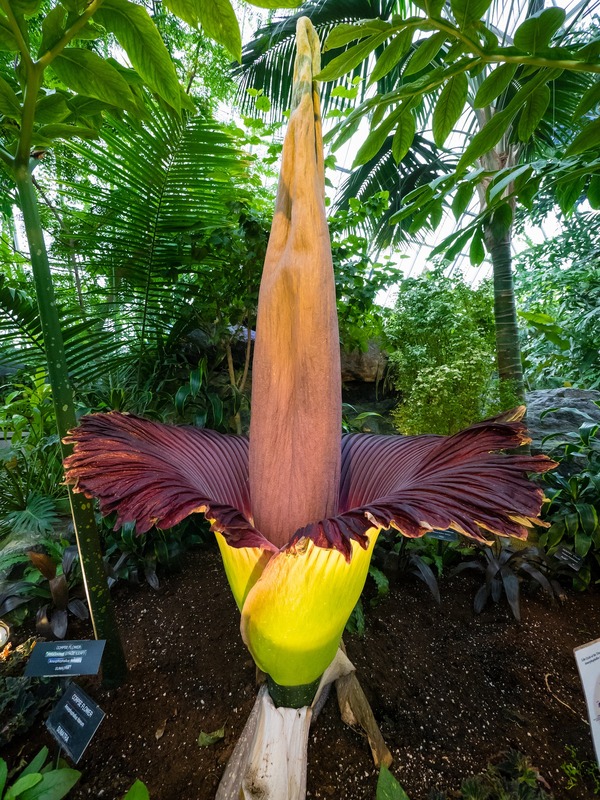 Konjac, also known as Amorphophallus konjac or devil’s tongue, is a plant and native in warm subtropical regions such as Japan or China. It’s a beautiful plant with a single leaf. The shirataki are made out of the corn of the devil’s tongue. You might see the term yam used in reference to the corn of the konjac plant. Due to the fact that konjac is largely based of glucomannan, which is a water-soluble dietary fibre, a number of digestible carbohydrates and calories is very low. This results in net carbs close to zero. They don’t taste of much, especially not if correctly rinsed. What might sound boring makes them great for almost any dish. In my opinion, the behaviour is to a certain extent similar to tofu. Depending on how you prepare it and with what flavours, the taste of the noodles change. In case you never have, give them a try. It’s certainly something new and different and enriches your diet too. 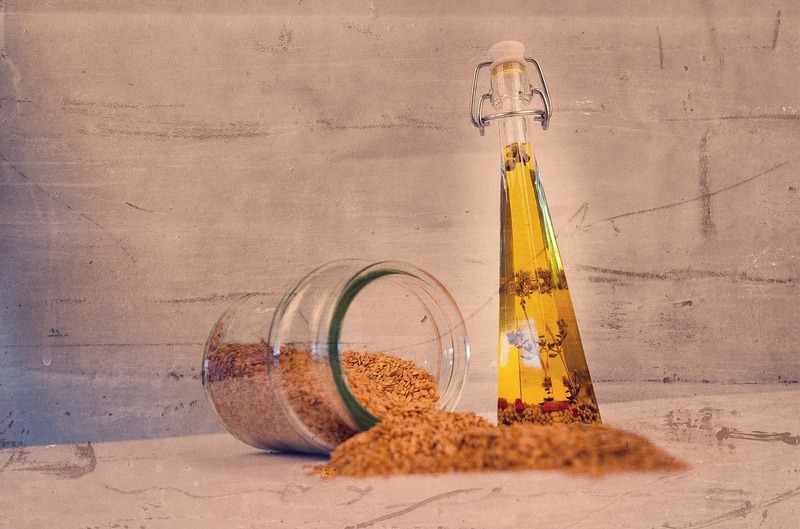 As a potential side benefit, research showed that people with a higher intake of dietary fibre tend to have a better health and are better in controlling their weight. Overall the benefits of dietary fibre are huge. According to Nutrition Reviews, people who have higher intakes of dietary fibre present apparently a lower risk for several diseases, such a heart disease, obesity or diabetes. Furthermore, it increases the chances to improve insulin sensitivity and glycemia in both diabetic and non-diabetic people. Not much to lose but plenty to gain. Try and share this recipe! Let me know how it was and if you enjoyed it. I am looking forward for your feedback. Prepare the shirataki noodles according to the instructions on the packaging. Usually, this involves rinsing, then boiling them for a few minutes and then rinsing them off again. Shred around half or a small carrot, clean the broccoli and the cauliflower and cut them into bite sized pieces. The idea is to eat them with chopsticks. Drain the noodles and place them in your ramen bowl. Wash out the pot. Bring the water to the boil. Add the broccoli with the cauliflower and the Korean miso paste. Add the ginger powder, the soy and also the fish sauce. It will take the vegetables around 10 minutes to be done. This depends on how big your pieces are. Slice the spring onion and the chilli into fine slices (similar looking to julienne). Clean and wash your shimp. Once the vegetables are done, add the miso paste and stir until it desolves. You can alway add more if you feel like it. Carefully transfer the vegetables and the broth into your ramen bowl. Quickly wash out the pot and heat up the sesame oil. Add the shrimp. Stir them occassionally. This will only take a minute or two. They ougth to get a little roasting coulour and absorb the flavor of the sesame oil. Add the carrots, the spring onion and the chilli around the edges of the bowl. Finally in the middle you place the shrimp. 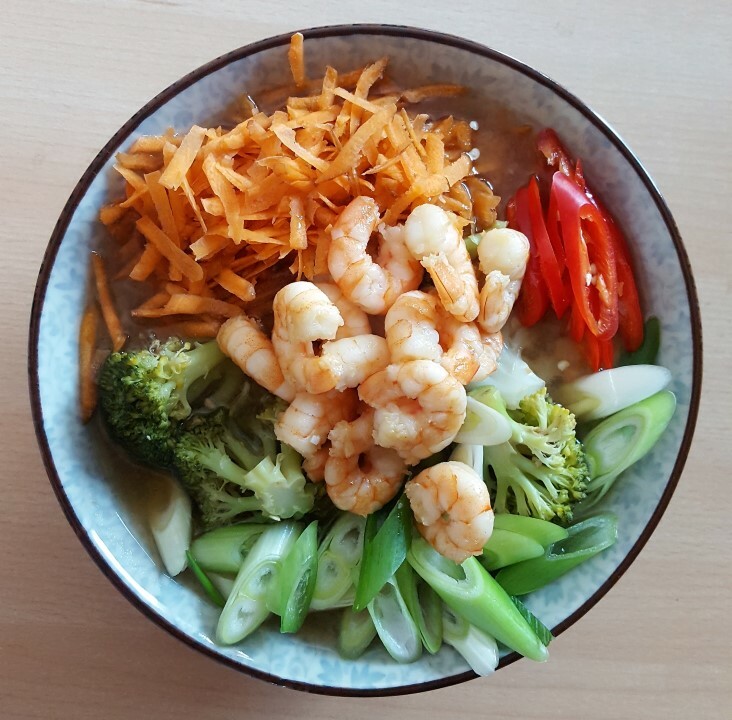 This entry was posted in Low Carb Diet, Recipe and tagged konjac, low carb, ramen, recipe, shrimp, soup, vegetables by Stefan. Bookmark the permalink.